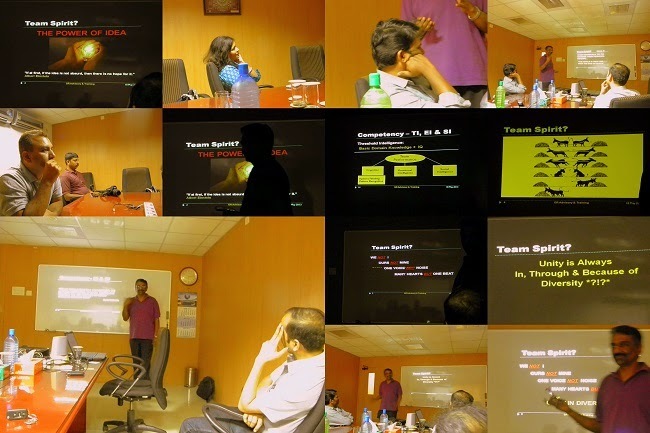 ILN Chennai Chapter conducted a Connect Session on Leadership Empowerment, on the topic Team Spirit, by Mr. Ganesh Rajagopalan. It was held on the 18th of May at the premises of Ankur Learning Ltd., No. 4, Naroji Road, Chetpet, Chennai. Mr. Ganesh had the audience captivated in his pied piper like attention-gripping presentation, which gave new insights into team work, how it should be perceived, and put in action. The Chennai Chapter committee members thanked Mr. Ganesh for his time and effort for coming with a well conceived and thought inspiring session. Copyright @2012 India Leadership Network. Travel theme. Powered by Blogger.